The February flower is Violet. The violet has appeared in myth, paintings and literature in history. Folklore tells us that Attis, a dying earth god, mutilated himself under a pine tree and as a result during spring equinox a felled pine tree would be brought to earth mother goddess Cybele. It would be wrapped in wool swaths decorated with violets, as it was believed they appeared from Attis’ blood on the ground. A similar legend points to violets growing where Greek Ajax killed himself in shame over an act of cowardice. The Greek dramatist Aristophanes used the phrase “violet-crowned city” to describe Athens in one of his plays, and English historian Macauley did the same. As the flower symbolizes love of truth, or the truth of love, the tomb of Roman tyrant Nero was said to be decorated with violets each spring by someone who had secretly admired or loved him. Violets were apparently used as a food source for the Tartans having been cooked down into a soup. In the Middle Ages, Monks called them the Herb of the Trinity and favoured the violet for its scent. Medieval herbalists believed violets had antiseptic properties and claim they soothed pain and also stopped the growth of malignant tumours. Romans believed they cured spleen disorders and gout. 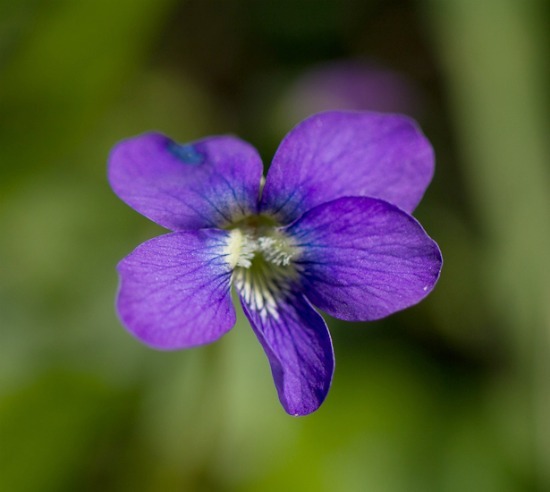 In the United States, the violet is a popular symbol with four states adopting it as a state flower. Wisconsin chose the wood violet in 1909 as state flower; Rhode Island selected it in 1897 and adopted that choice in 1968. Illinois picked the violet as their state flower in 1907 and the ‘common meadow’ violet became the official state flower of New Jersey in 1971. The flower associated with St. Valentine’s Day has often been identified as the rose, but in actual fact, the violet is connected to the Christian priest who was imprisoned by a Roman emperor. As the legend goes, St. Valentine kept encouraging believers with messages of friendship and love. He apparently crushed violet blossoms found outside his cell to make ink, which he used to write on leaves with a dove delivering the messages. American poetess Phoebe Fulkerson Harris documented the tradition of sending postcards and letters on St. Valentine’s Day with violets with her poem “Lines accompanying a bunch of violets sent on St. Valentine’s Day” in 1900. It is also a well-known practice in New England to decorate a Valentine’s Day gift of a box of chocolates with a bouquet of violets.